Here we have Coco, Whiskey and Ginger who are all cross breeds. Coco is unfortunately no longer with us and the photo was very difficult to work from, however with the help of her owner and various photos I have been able to complete her portrait. I have had to improvise a little with Whiskey's eyes due to the flash back. I have also straightened the angle of the head so that it is more level with being the centre of the portrait. Ginger's collar colour has been altered from the original at the owners request. 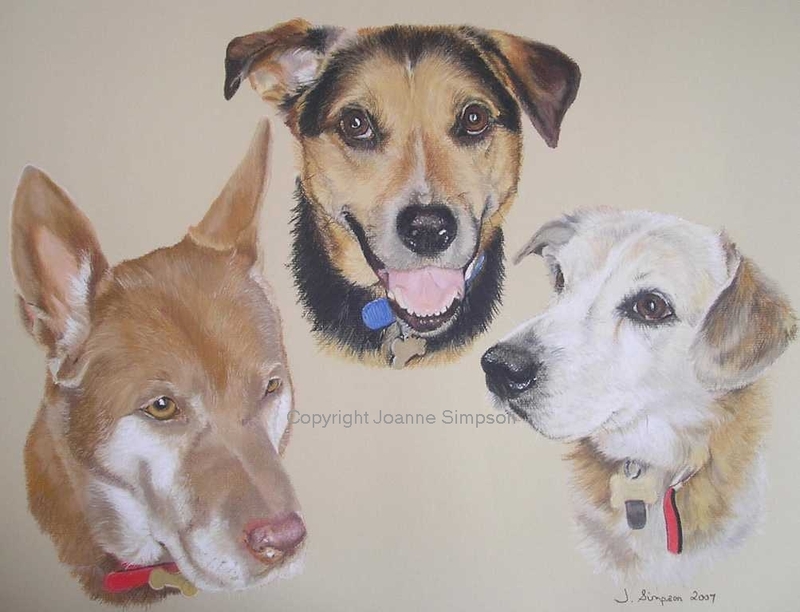 I have also had to customise the size of the portrait so that it would accommodate all three dogs comfortably. Unframed portrait size is 19.5x15 inches. It looks absolutely brilliant!! The colours are spot on - you have all 3 just right. Can't wait to get this - will e-mail you on receipt - we have decided to keep this till Xmas to give my Mum and Dad as it is so special, I think it will make my Mum cry without fail - and I am sure that you will hear from her after Xmas!! We will be getting it framed fairly quickly - so will send you a photo when it is. Don't be surprised if I end up contacting you again for some portraits for myself!! What can I say - I have just got home and opened the portrait - it is absolutely amazing. 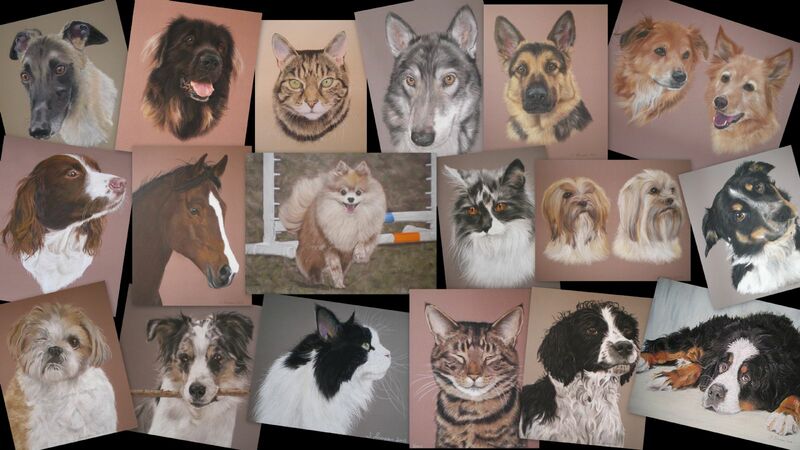 You have got all 3 dogs absolutely spot on - what an amazing talent you have!! Thankyou so so much for doing this for us, my Mum and Dad will be over the moon with this as a Xmas pressie. The only problem is - I want one too - so do not be surprised if I get in touch with you in the New Year for something else! Thanks so much - and we will send a picture of it framed as promised. We will be sure to recommend you to friends and family. I am Cynthia, the Mum of Michelle and Nigel, who commissioned you to do the portrait of our beloved dogs, CoCo, Whiskey and Ginger. I was thrilled to receive the picture on Christmas day, words cannot express the joy it gave me and the future pleasure I will receive just looking at the three of them together on my lounge wall each day. You have captured their beauty, and their individual personalities with remakable results, even the wetness of their noses! I can't thank you enough. Good luck with your future career, please carry on the good work it gives so many people such pleasure, you should be very proud of your self!